The Pinnacles are located in Nambung National Park, about 25 kilometres south from the town of Cervantes and about 250 kilometres north of Perth, Western Australia. The Pinnacles were sculptured by wind, rain, vegetation, sun and time for many thousands of years from limestone. 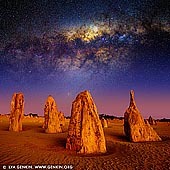 These limestone formations reach four metres tall of sand of varying colours. It is a favourite subject for photographers. The Pinnacles were formed over time from lime discharging from the sand; and from the rain having a cement effect on the lower levels of the dune, producing a soft limestone. The yellow quartz landscape provides impressive imagery, which one could imagine existing on Mars. There are now over 150 000 of these fascinating formations standing up to 5 metres tall. Some of the Pinnacles have a tombstone-like shape while others rise from the desert plain in jagged columns. The Pinnacles are renowned for their mysterious beauty and have, over the years, been a popular subject to photographers from around the globe. The Pinnacles remained relatively unknown to most Australians until the 1960s, when the area was added to Nambung National Park. The area receives over 250,000 visitors a year, from all over the world. A visitor precinct and interpretive centre was completed in March 2008. The best season to see the Pinnacles is spring from August to October, as the days are mild and wildflowers start to bloom. The pinnacle formations are best viewed in the early morning or late afternoon as the play of light brings out the colours and the extended shadows of the formations delivers a contrast that brings out their features. Most animals in the park are nocturnal, but emus and kangaroos can also be seen during the daytime, more commonly in the evening or early morning. There are a number of walks to choose from at the Nambung National Park. The park also offers the opportunity for fishing and swimming. At the park you are likely to see a variety of birds and animals including the Western Grey Kangaroo, Honey Possums, Emus, Carpet Pythons (which are harmless) and White-tailed Black Cockatoos. The park also features a number of native plants. How to get to the Pinnacles Dsert in Nambung National Park: from Perth head north along the Brand Highway and then turn left at the sign to 'Cervantes'. From Cervantes head south two kilometres to the Nambung National Park boundary and continue a further fourteen kilometres to the Pinnacles car park. This road is not recommended for caravans or rental cars. There is a parking bay at the boundary of Nambung National Park where you may leave your vehicle. While there are no camping areas within the park a range of accommodation is available at Cervantes.